We take a look at hip-hop's most ambitious culinary endeavors, both past and present. Given rap’s obsession with food, it’s not surprising that many hop-hop stars with some money in their pockets have decided to get into the restaurant game. Some, like Ludacris, appear to do so out of a genuine love of food and a good scene; others, such as Jay-Z, are motivated by the status that investment in a buzzy hot spot can gain them; and dudes like Rick Ross seem to just want a hot-wings joint that they can shut down whenever they want. While many endeavors have ended in complete failure, there are some notable successes in the annals of rapper-run restaurants, fast-food franchises, and juice bars. And as hip-hop’s palate expands with each passing Action Bronson mixtape, we expect to see many more entering the game in coming years. To make sure you’re up on this odd corner of the culinary world, we present 12 restaurants that have boasted rappers as their owners or investors, along with a look at their track record, signature dishes, and references on wax. Status: Open Locations: New York, NY; Brooklyn, NY; Atlantic City, NJ; Las Vegas, NV Business title: Owner Lyrical reference: "At the 40/40 club, ESPN on the screen/I paid a grip for the jeans, plus the slippers is clean/No chrome on the wheels, I'm a grown-up for real." – "Dirt Off Your Shoulder," by Jay-Z Type of restaurant: An upscale sports bar-lounge serving new American fare and bar snacks Signature menu items: Bone-in dry-aged ribeye with cognac sauce, gorgonzola butter, and garlic-rosemary roasted potatoes; Colossal Shrimp with truffled angel hair pasta The name of this lounge refers to the heavy hitters of Major League Baseball fame who put up 40 home runs and 40 stolen bases in a single season. Well-known for his love of sports, Hov opened the mini-chain as an upscale answer to the average sports bar—a place for folks who'd like to sit courtside at the game, not in the nose-bleeds. The endeavor has had its fair share of press over the years, both good and bad (a recent lawsuit concerning a chef "stealing" a chicken-wing recipe was particularly embarrassing) . 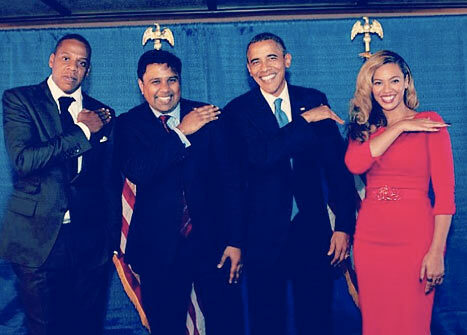 However, the photo below—from a recent Obama fund-raiser at 40/40—will forever remain untouchable. Status: Open Location: New York, NY Business title: Investor In the press: According to the Observer, Jay-Z plays Jenga at The Spotted Pig and kinda blows at it. Type of restaurant: English-style gastropub Signature menu item: Chargrilled Burger with Roquefort cheese and shoestring fries In our guide to dining like Jay and Beyoncé, we mentioned that the rap mogul is widely known for having a hand in chef April Bloomfield's white-hot West Village spot. Aside from eating with his lady, we wonder whether he ever pops in to clink glasses with Mario Batali or discuss politics with Bono, both of whom are also investors in the restaurant. Status: Open Locations: Harlem, NY Business title: Owner Lyrical reference: "That chicken McNugget?/That Box Head kid that don't know how to act?/Instead of that Chicken McNugget, you know what you need?/You know what you need baby?/You need a value pack." – "Cut That Zero," by Doug E. Fresh Type of restaurant: Caribbean and soul food joint serving “Fresh Chicken & Waffles, Fish & Waffles, and More.” Signature menu item: 6-piece BBQ chicken and waffles, a.k.a. "The Value Pack" Human beat-box, or slinger of jerk chicken, waffles, and fish sandwiches—who says you have to choose? Not Dougie E. Fresh. The old-school rap legend's uptown spot was long delayed after he started talking to the press about it in 2008, but it finally got off the ground in 2010. In a Village Voice review that came out soon after, Robert Sietsema gave it a "B" rating: "The fried chicken was lightly dusted with flour and fried, skin intact. The bird had an herby flavor, which was welcome and not overbearing. The waffle was standard for Harlem -- made from a mix incorporating artificial maple flavor, which used to drive me nuts, but now I'm used to it. There was some cinnamon, too. The waffles are made on grate irons that sit in the front window, masked from the street, which is too bad, because the sight of waffles being made might be a big lure." Status: Open Locations: Bronx, NY Talking the talk: Styles P told Trap Juice TV, "I believe juice keep you right." He also added, "[It] makes my balls go nuts." Type of restaurant: A juice bar serving shakes, moss, and wheat grass, along with house special blends. Singature menu items: The Bronx (mango, strawberries, melon); Ghost (pears, strawberries, blueberries) Styles P has been juicing for over 10 years and is now trying to promote the health benefits of freshly-squeezed fruits in the Bronx. The LOX frontman hopes to encourage folks in the neighborhood to give up fast food for smoothies. We're guessing that it wasn't juice that helped him develop his signature raspy voice, but we salute the man for trying to bring something positive to the block. Status: One closed, one open, eight more to come Locations: Chicago area Business title: Owner In the press: Maria Brooks, Fatburger Marketing Coordinator, on the closure of one of 'Ye's Fatburgers: "It's unfortunate that the Orland Park location owned by Kanye West Foods, LLC has closed, but we hope to have a presence in the Orland Park community at some time in the future." Type of restaurant: Burger joint known for battling it with In-N-Out for West Coast supremacy. Signature menu item: Fatburger with the works (pickles, relish, mustard, mayo, tomatoes, onions, and lettuce) Kanye has stated plans to open ten Fatburger locations across the Chicago and L.A. areas through his Kanye West Foods, LLC corporation. The first location in Orland Park closed fairly abruptly after opening, but Fatburger has a cultish following, so we have faith he'll bounce back. If he needs any business advice, he can always hit up other rappers who have been involved with the franchise at one point or another, including E-40, Queen Latifah, and Pharrell Williams. Status: Opening soon Locations: Hartsfield-Jackson Atlanta International Airport Business title: Owner Lyrical reference: "You see I live a life filled with chicken and malt liquor." 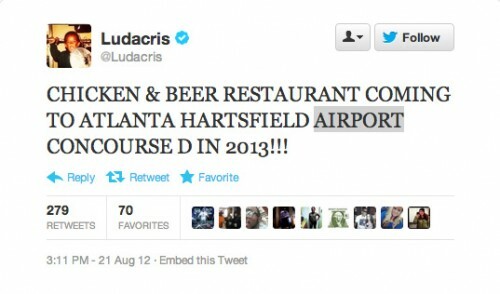 – "Word of Mouf," by Ludacris Type of restaurant: Says Luda, “I'm taking my restaurateur footprint into the busiest airport in the WORLD! Hartsfield-Jackson ATL International! Chicken & Beer coming soon!” Signature menu items: We could venture a guess... After the closing of Luda's first Atlanta dining destination, Straits, the dirty-south rapper thought it might be time to give up Malaysian, Indonesian, Chinese, and Indian fusion for something he knows best: chicken and beer. Chatter about the new venture has died down since the announcement at the beginning of the year, but we haven't seen anything to suggest that it's not still in the cards. If rapper restos are the future of airport dining, we wouldn't be mad. Status: Open Locations: Los Angeles, CA Business title: Owner Talking the talk: From "chain-snatchin'" to "charm-snatchin'" to weiner-slingin'—watch Don Jaguar chat about hot dogs and rap history here. Type of restaurant: Classic American Signature menu items: Beef jumbo dog, tamales, Jamaican beef patties, ol' school coffee cake Don Jaguar, a.k.a. Earle The Poet—a man best known for laying down tracks with Ice Cube and Eazy-E back in the day—used to run a hot dog cart called Earlez in the Crenshaw Santa Barbara Plaza. Next came this brick-and-mortar spot, Earlez Grille, co-owned with his brother Cary. The casual joint offers a menu of beef, turkey, veggie, and vegan hot dogs, as well as chili tamales and chicken wings. "Everybody knows me," says Earle of his loyal local following. Check it out at earlezgrille.com. Status: Both closed Locations: Las Vegas, NV; Clinton, IA Business title: Owner Culinary pedigree: Flavor Flav was the head cook of Nassau County court house and Uniondale High School in Long Island back in the day. Type of restaurant: American fast food Signature menu items: Fried chicken, red-velvet waffles, ribs We were shocked to hear about the shuttering of both Flav's Vegas chicken spot and the FFC in Iowa. Some scary comments about potato salad at the latter, taken from an interview Flav did with TMZ, offer some indication of why they failed: "Let me be straight up with you, I went up inside there on April 2nd and I found potato salad that expired on February 28, and it's then when I realized I can't do business with [partner Nick Cimino] and I really hope no one ate those potatoes." Regardless of the rancid salad incident, it's kind of a shame that things didn't go better for the boisterous hypeman; based on the video below, it appears that the man might actually know a thing or two about chicken. Status: On hiatus Locations: Texas Business title: Owner Lyrical reference: "Making paper stacks/Making paper stacks/Slinging masa like crack." – “Like This and Like That," by Chingo Bling Type of restaurant: Tex-Mex Signature menu items: Al pastor tacos, chorizo con papas tacos, tamales Chingo Bling transformed his family-owned taco truck into a vehicle for slinging mixtapes, as well as the focal point in his music videos. But after his They Can't Deport Us All campaign, his traveling taco and tamale truck wound up vandalized, shot at, and then stolen. We're not sure whether it'll be back on the road soon or not, but what we do know is that Chingo is a Tex-Mex legend—just watch below as he makes a lady tremble in ecstasy by dressing her up like a taco in a tub. Status: Closed Locations: Bronx, NY Business title: Owner In the press: Fat Joe has plans to launch a cooking show with Queen Latifah, and he says of his plans: "It's going to be real dope. We're going for Rachael Ray and [them]." Type of restaurant: Casual American spot serving burgers and fried seafood Signature menu item: Fat Joe Lean Back Burger After loosing 88 pounds, Fat Joe swore off all the high-fat foods that presumably helped give him his rap name. We wonder if that change of heart contributed to plummeting sales and the eventual closure of this Bronx fried-food joint—after all, slinging burgers and fries while going on a diet would be like rapping about selling drugs while working as a parole officer, which would never work (oh wait...). Even though the restaurant was a fail, the cooking show with Queen Latifah might be a hit. Watch out Rach, Joe's coming for you. Status: Both locations closed Locations: New York, NY; Atlanta, GA Business title: Owner In the press: From a dated NYMag listing: "Like all things Puffy, Justin's is a testament to the drawing power of celebrity and bling: It's not uncommon to see music stars and athletes stop by amid entourage to chow down on jerk jambalaya hen or lobster tails and watch sports on the many large-screen televisions." Type of restaurant: Southern-Caribbean Signature menu items: Smothered turkey wings, P. Diddy’s Seafood Pan Roast, P. Diddy’s Jumbo Fried Shrimp Thanks to Diddy's transcendent star power, the NYC and Atlanta locations of Justin's (named after his son) were both celeb favorites during their heyday. But Puff's always got his hand in multiple pies, and restaurateur turned out to to be one of the titles he was willing to drop as he moved into other arenas, like fragrances and premium vodka. Given that he once rapped, "I can't even hold down food, I'm so rude/Bad attitude, what point I got to prove/Sometimes to win something you gotta lose," it's safe to say that the closing of Justin's didn't break his spirit. Given rap's obsession with food, it's not surprising that many hop-hop stars with some money in their pockets have decided to get into the restaurant game. Some, like Ludacris, appear to do so out of a genuine love of food and a good scene; others, such as Jay-Z, are motivated by the status that investment in a buzzy hot spot can gain them; and dudes like Rick Ross seem to just want a hot-wings joint that they can shut down whenever they want. While many endeavors have ended in complete failure, there are some notable successes in the annals of rapper-run restaurants, fast-food franchises, and juice bars. And as hip-hop's palate expands with each passing Action Bronson mixtape, we expect to see many more entering the game in coming years. To make sure you're up on this odd corner of the culinary world, we present 12 restaurants that have boasted rappers as their owners or investors, along with a look at their track record, signature dishes, and references on wax.